The Barf Diet. It makes me want to barf just thinking about it, never mind writing about it. Yes, there really is such a diet and it's even supposed to be good for dogs: Barf World says so! BARF is actually an acronym for Biologically Appropriate Raw Food or Bones And Raw Food. That's a relief, isn't it, because the diet is not actually barf, although if you say it enough times, it makes you feel like barfing. 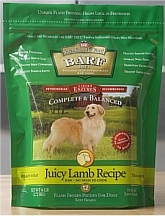 The Barf Diet was developed to provide dogs with foods that evolution intended them to eat: raw meat, bone, fruits, and vegetables -- with the addition of some natural supplements that keep things moving as if your dog were in the wild. Supplement, Zinc Oxide, Manganous Oxide. Notice there is no grain in the product, as grain is not natural to a dog's diet, but an ingredient commonly found in canned and dry dog foods. There's a lot of information on the website, BarfWorld.com, including testimonials from users, how to introduce Barf into your dog's current diet, how to alter the Barf recipe for a cat, and an informative blog. I'm going to look for a distributor around my home so I can buy some Barf patties for my dog. If you can't find the product near your home, you can order online, but shipping costs are high as Barf is shipped frozen. That's all the barfing I'm going to do today! Want to Make Your Bird Feeder Squirrel-Proof? The Animal Video of the Day!!! Check Out Melissa & Doug’s Giant Animal Buddies!